Lightly moisten your hands with cold water. Take 1/2 cup cooked rice and form it into a ball, packing it firmly. Poke a hole into the center of the rice ball with your finger and insert a 1/2 teaspoon ginger slices or 1/4 umeboshi plum into the center. Pack the ball again to close the hole, lightly moistening hands if needed. Fold the nori sheets in half and tear along the fold. Fold in half again and tear on the fold. You should now have eight equal-size squares of nori (about 4" X 4" - four from each sheet). Lightly moisten hands, trying not to use much water, and place 1 square of nori on a rice ball, packing until it sticks. 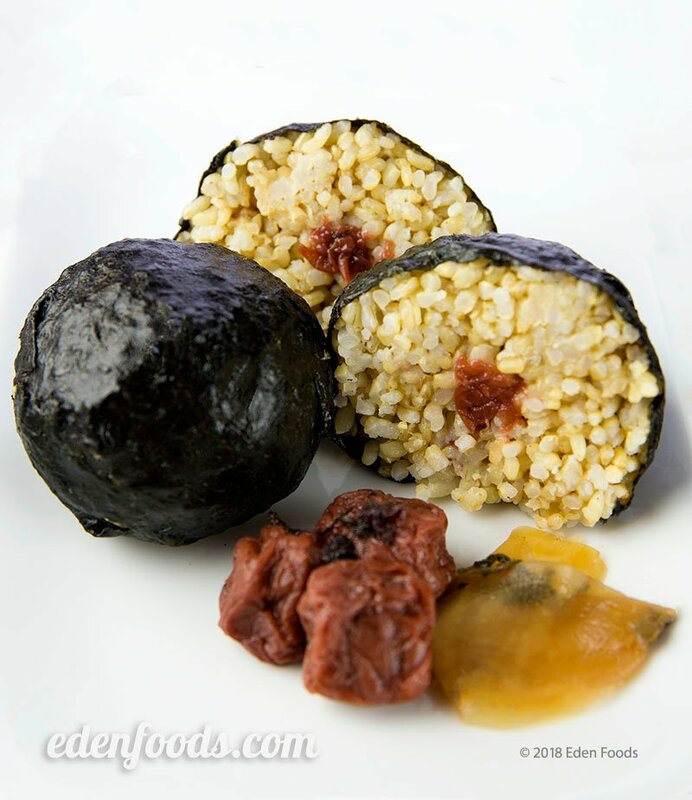 Take another square and place it on the rice ball completely covering the rice ball with nori. Pack gently, but firmly to make sure the nori adheres to the rice. Repeat the above steps until you have 4 rice balls completely covered with nori. Eat as you would an apple. Rice balls are great for backpacking, camping, picnics, breakfast, lunch or dinner, or just a healthy, delicious snack anytime. Note: Use only leftover short or medium grain brown rice to make rice balls. Long grain and basmati are not sticky enough to make rice balls. Note: to make a triangular-shaped rice ball, form the rice into a ball as directed above. Then cup both of your hands in a V-shape, rotating the ball in your hands, while applying light pressure from the top and sides with your palm and fingers until it forms a pyramid-shape. Place the umeboshi in the center as above and apply two pieces of nori, one on each side.